The longer you evolve inside any system, the more you start to perceive and understand its tacit rules. For example: in Blood Bowl you quickly learn to take safe moves first, that your opponents 1D blocks are never punished and that Orcs cannot GFI. Well, the Big O is no exception. You quickly understand that nobody besides PapaNasty can make sense of Australian time zones with daylight savings, that Big O does not have an Orc problem and that there should always be a Skaven team in division one. The first two points could be the subject of a thesis, so today we will talk about the last one. My interviewee today is hailing from New Zealand. After many a season spent in the double shadow of two famed Big O Skaven plagues; he's now in division 1, Big O's Horned Crown resting upon his brow. He reached round of 16 during season 8 playoffs so exposure is no problem to him, and you will find him co-casting the recaps of division four in company of his fellow division 1 dweller, Tommo. He's showing Big O "The Rat Way To Go", JamusMcgamus! After a few warm-up questions, launched into a nocturne interview with Jamus. While I often see him around, I only knew a few things about him. I then jumped on the opportunity to interview him and learn more. Starting with the classic questions then seemed a solid move. What is the story behind your nickname? Just had to choose something when I started playing things online, it just stuck around really, but these days mostly shortened to Jamus as around Discord. How did you come to it then? It was a very long time ago and I couldn't remember now, had it for years. Pry further we shall not, lest we delve too deep. How long have you been playing online for? Ok, what kind of games do you tend to play, other tactics/strategy games such as Blood Bowl or? A variety but strategy tends to be my favourite. Sightings of Jamus playing Crusader King II have been reported, you know who to turn to if you need to trim down the old family tree. And how did you start playing BB? I ended up watching some of it on Youtube to finally know what 'that Warhammer football' game was, got the gist of the basics like assists and blocking dice from that. Then when I checked out the store page Legendary Edition happened to be about to release and on a slight discount, so I got in at a bargain with that good timing. Oh ok, so you've been playing for a year or so? Yep. A year and a couple of months overall. And already in Division 1, nice! ...or cowardly enough All a matter of risk aversion and pixel hugging if you want that. Even if discretion is the better part of valour, I still can't picture him as a cowardly kind of coach. The number of his appearances in last seasons Bent-O proves it in my book. Which season did you join ReBBL in then? Season 7, the first one with LE teams. And I nearly signed up as a Bret team then changed it to Skaven because I was scared I'd never be able to score without Gutter Runners. With not one, not two but three MA10 Gutter Runner at the time o this interview, such fears should be allayed. 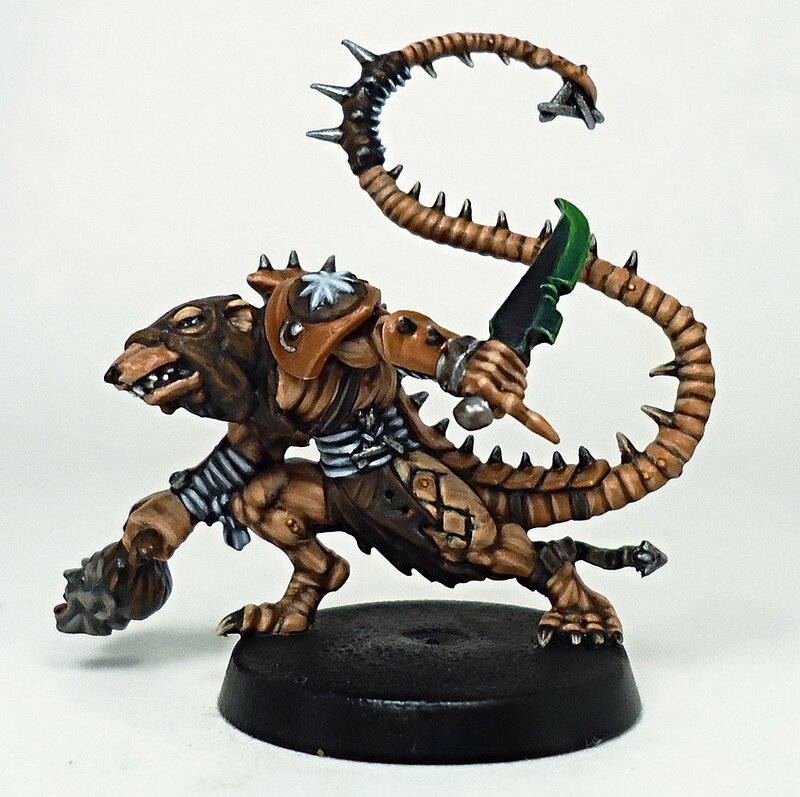 Skaven were already your team of choice back then? Not really. I think I'm a control player at heart, I played a ton of them initially without much success. Then trying teams that could not out strength and just try to maximise 2d blocks, I found the game got a lot easier when you had no choice but to think about the ball and what you could do concerning it. Brets were the first team I had that experience with, which might be a bit ironic since they actually love to put the boot in and at least -try- to outbash things even without too much reason to be able to. Things worked indeed, as will be proven below. What would you say your the most proud of in your BB coach career until now? That's tough... I guess playoffs in season 8? Ended up only having a battered Lizard team between me and a hype vid, but Larkstar is very good... And I got to knockout Papa through a bit of a dicing. And that would be a grudge. Rumours have been running rampant about D1 orc coaches entering a "friendly" competition based on the number and type of rats killed. What are your goals for this season, now that you made it to the highest ranks of the Big O? Qualify for playoffs and make as deep a run as possible; preferably with the team still looking healthy enough for another season. Now that you have several competitive seasons under your belt, what would you say your strengths and weaknesses are? Well, weaknesses are easy... If removals pile up on me tilt can be a factor, and on defense I can tend to not pull the trigger and tell myself there will be a less dicey opportunity for the "big Skaven turn" at another point, which doesn't always happen, but I think I'm getting better at that. And maybe just discipline, I'm very strict not to reroll things just because a bad dice roll happened and I don't like that. But I guess you just have to be playing Skaven, since you are expected to go for a one turn at the end of far more drives than not. Do you prepare in any way before your games? Like watching your opponent's games, or re-watching yours, or anything? Not really just look at the team sheet and try figure out what I want to avoid doing and what I do want to do. Try and anticipate what they'd take as inducements or figure out what I will be taking. You earlier mentioned Sage as an inspiration to play Skaven, do you have any other coaches you look at for self-improvement? Well that's the way of Blood Bowl: even the lightest team won't shy away from killing your team. I wouldn't kill a thing given the choice, except on turn 16 fouls since they had a bounty for killing on a turn 16 foul at some point. And because there's something hilarious to me about a turn 16 foul killing something. So you don't like killing things, but on Turn 16 fouls? I guess so because it just has no business happening at all, so when it does and its a death... you have to see the funny side. As you said earlier you're giving upstarts a go, is there any other ReBBL competition you would like to join in ? I don't think so atm, one day tourney's can be very fun though. I am still convinced that Jamus would make a recruit of choice for any clan that could manage to convince him. I see you also co casts the Div 4 recaps with Tommo this season. Is it something you would like to do more eventually: casting, admin-ing or writing? Probably get into streaming my games when I can, but not atm; and being on a recap is already a good time. What's the player skill you're having the most fun with? Probably Claw as it finally feels like I've got all the advantages of Skaven at my disposal, with a killer just as dangerous as anything on a Chaos team and 4 players Wood Elves would be happy to use in the gutters. It really feels like peak performance for the rats. And I finally have a tool to say "No!" to being based all over the place which .... people will still do probably, but at least I can ClawPOMB them now! Insert usual remark about dash coaches loving their punching skills, and vice versa. Which is your favourite Star Player? If only More Hare took block. . . If you could make any change to BB2, but a single one, what would it be? Change Sneaky Git so whether you break armour or not, rolling a double on the armour dice isn't a send off. Imagine Pro Elf linos running around with DP and Sneaky Git on two normals, and being scary rather than laughed at. I dream of a day. Do you have any snacks and drinks to recommend to accompany those long BB games? I typically just have coffee and water. Is that the place with the crazy Slaanesh roster? Oh my god, there's a billion of these! Clan Eshin: all the gutter runners, all the time. Many thanks to Jamus for taking the time, and night time at that, to answer my questions. As with many, I am glad to know him a little better, and wish him the best of luck for his season among Big O's elite.